Ever have the sneaking suspicion that some academics get to have loads of high-tech fun under the flimsy excuse of publishing a few explanatory papers about it? If you do happen to think this way — and are looking for a bit more evidence to support your sense of seething jealousy — check out the latest project to be created at the University of Iowa. Working with engineers from UI College of Engineering’s Center for Computer-Aided Design, researchers there have created an ambitious virtual reality simulator which mimics the effects of driving an ATV, complete with Oculus Rift headset, motion-sensing suit, and a moving platform that simulates changes in terrain. 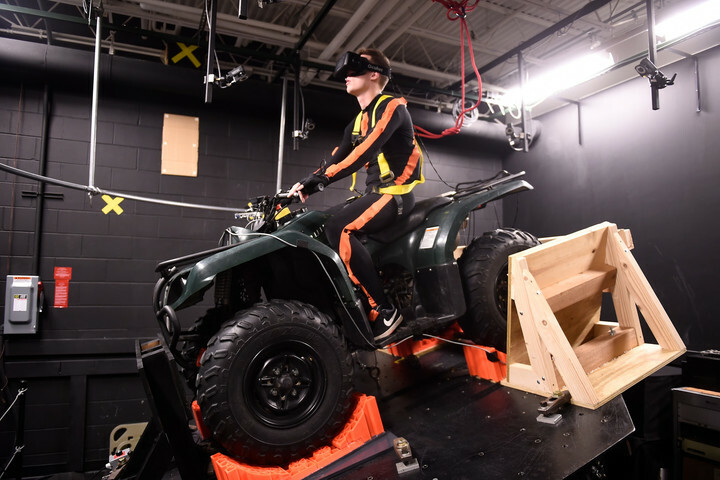 Using this custom rig, it’s possible to mimic what it is like to drive an ATV on rough terrain: right down to simulating the forces exerted on a driver as they speed up and down hills, navigating obstacles and rough ground.